The best line in Philly's annual Bastille Day cabaret show is "Let them eat Tastykake!" because this signals that 2,000 Tastykakes are about to be flung from Eastern State Penitentiary's towers to the crowd below. It's the grand ending of The Bearded Ladies' French Revolution reenactment, where the experimental cabaret troupe sings and dances its way to Marie Antoinette's beheading. 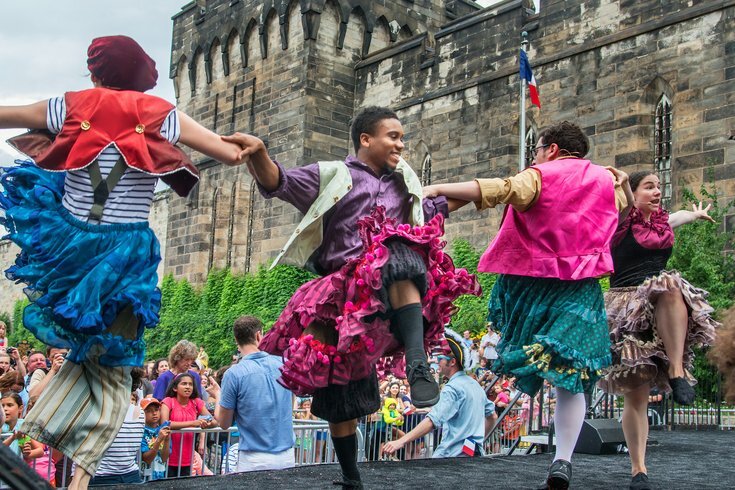 This year, the free performance outside Eastern State Penitentiary will take place on July 16. Just because we know the historic events of Bastille Day, doesn't mean we know everything that will happen during Philly's Bastille Day cabaret show. This year, the troupe will be incorporating modern topics (bathroom liberation, the Flint water crisis, the DNC and superdelegates) into its performance. If you've never been and aren't sure what to expect, imagine a 6-foot French baguette, confetti cannons, stilt walkers, a real and functioning guillotine, an appearance by Ben Franklin and plenty of costumes. Attendees are invited to get in on the action, too. Standing in the crowd is free, but VIP tickets are available for $40. Those sitting in the VIP section might want to dress up, to blend in with the troupe. Once the hourlong show wraps up around 6:30 p.m., the rest of Fairmount Avenue comes alive. The penitentiary will reopen for rare twilight tours at a discounted admission price ($8 online, or $10 at the door), while bars and restaurants in the area annually offer deals on the French beer Kronenbourg. The London Grill will throw an after-party featuring The West Philadelphia Orchestra, French foods and dancing in the street. $4 Kronenbourgs will be served all day. The restaurant is also getting in the spirit of Bastille Day on its actual date, July 14, with a French Fling Bar Crawl beginning at 6 p.m. Eleven bars are participating, serving up $3 Kronenbourgs all night. No registration is required. Another Fairmount bar that already has its Bastille Day specials listed is Urban Saloon, which will serve $4 Kronenbourgs and feature a pig roast.